Thank you Microsoft, Content types just got user friendly and easy to use and promote! 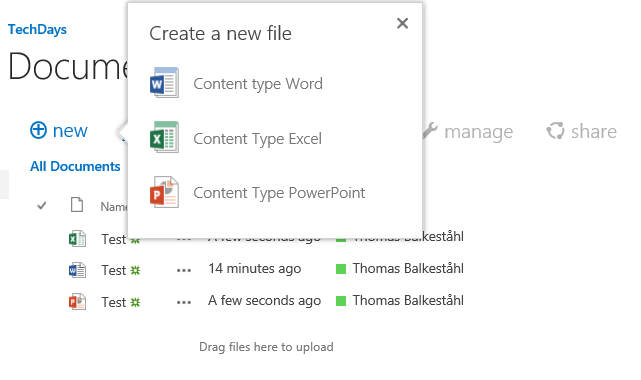 Before yesterday, I knew that the ‘new document’ button in a document library became useless when you enabled Content types in a document library. This has for me and many of my customers been a huge drawback since the ‘new document’ button was still there, in plain view and for the regular user, what they were meant to use. This old behavious was that when you pressed on ‘new document’ in a document library with multiple content types, you got the upload document dialog. Cramo, this is where I did the demo when this change presented itself to me! A pleasure to work with you guys! Well… that’s odd. 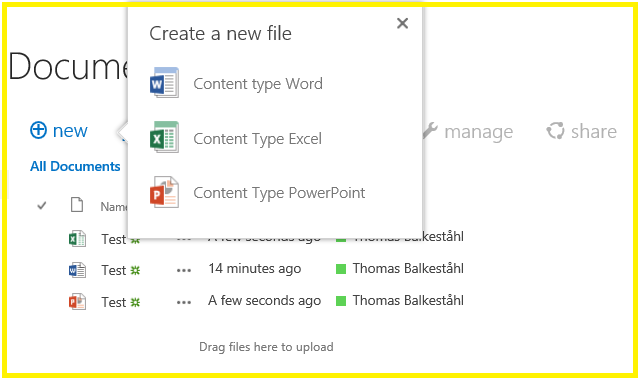 Our document libraries changed the behavior of the “new document” button, but instead off letting us choose the content type, it directly opens the default one on the desktop app (Word). The content type “bubble” with the options to choose appears, but we can’t click it because the default CT was already opened. You have to add your content types to the library in settings first, the content types you add are the ones that will show up in the new drop down. Does that help any?